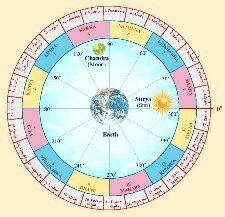 Uttarashadha Nakshatra: Spread from 26:40' Dhanu to 10: of Makara. Lord is Guru and Sani. The derivatives from Uttarashadha are closely allied to those of Poorbashadha. He will be refined, soft spoken, and pure hearted with an innocent looking expression. In case he happens to occupy a very high position in the society, he will not like to express pomp and show and will dress like a simpleton. He gives respect to all and particularly women folk. He is god fearing. It is not easy for others to find out his underlying merits and demerits. It is only after several acquaintances and dealings that one can actually come to a conclusion about the behavioral aspect of this native. In most of the cases, it has been noticed that there will be black mole around his waist or on the face. A slight reddish color is noticed in his eyes. He will be very plain in his dealings and will show utmost sincerity in all the work he undertakes. He will not deceive others and would not like to cause any trouble to others. So much so, due to his inherent good behavior he often lands into uncalled problems. While he is a simple-hearted soul, he will not subdue to any pressure and will not bestow full confidence on anybody. But once he takes a person into confidence nobody can change his decision. To a certain extent, he is a slave to flattery and expects that others must look after his welfare. He will not take any hasty decision but indulges in full consultation with his trustworthy people before coming to the final conclusion. While he is very much involved in all the activities he undertakes, usually he is a lazy fellow. Even in the state of conflict he cannot utter harsh words directly to anyone. In spite of a difference rising in the opinions he will not like to express his unhappiness to others. Any discussion he makes with others will be without expressing any ill-will. He is bound to shoulder many responsibilities at a young age. Due to this he is fully trained to shoulder any responsibility with perfection. Once he is convinced that any action carried out by him or words uttered by him happen to be wrong he will not hesitate to repent and express his apologies. Each and every action of the native requires recognition from others otherwise he is dragged into the state of unhappiness. He is subjected to maximum happiness at one moment and maximum unhappiness at the very next.